To begin customizing, click View > Toolbars > Customize or right-click the area next to the Menu Bar and left-click Customize. Drag and drop icons from the selection list to or from the Toolbar. Commonly moved buttons include Print, History and Bookmarks. You can also check the box for smaller icons if you prefer. You can hide or reveal Toolbars (some come with Firefox by default, others you may install). 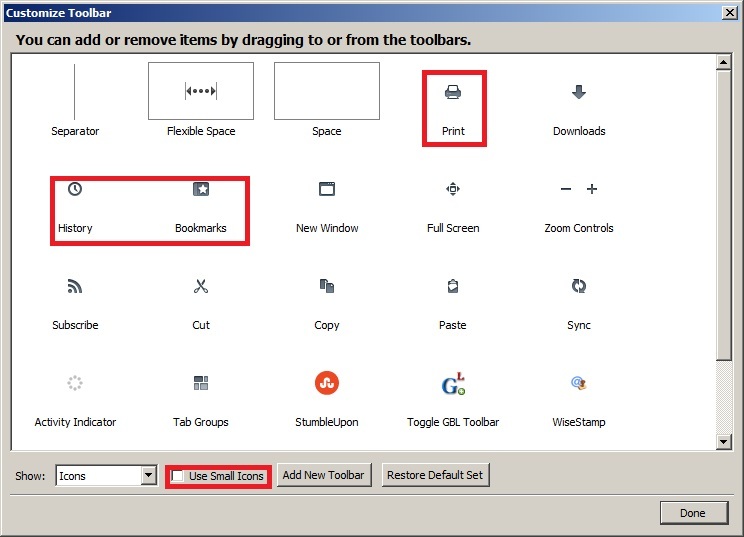 To choose which Toolbars to display, right-click an empty area in the Toolbar or near a tab. Check the Toolbars you want, uncheck the ones you don't. Here you can also change the layout to show Tabs on Top of your Firefox window.